If you need help with the washing of the front area in your property, patio, driveway or other place, use our services. We offer professional jet washing in Kilburn which guarantees excellently maintained outdoor floor coverings, walls, swimming pools and fences. 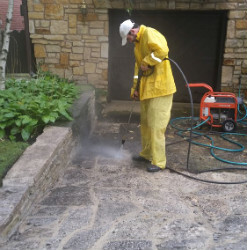 Our workers are supplied with top-quality cleaning solutions and solvents along with powerful pressure washers to do their work effectively and well. They can transform your slippery, dangerous and filthy patio, pathways, walls, fences and playgrounds. Use our services to get the help you need with the cleaning of your outdoor areas. You can use our services to improve the appearance of your overgrown, dirty and slippery outdoor areas. Our workmen utilize high-grade pressure washers which can transform your patio, driveway, playgrounds, swimming pool and other areas. They apply hot or cold water and the proper detergent to remove limescale, mould, moss, algae, paint, bird faeces and contamination. Our jet washing services guarantee excellent results and can be booked in Kilburn by proprietors of residential and commercial estates. You will receive professional work with outstanding results that will enhance the state of your property. We work seven days in the week and can restore the cleanliness of your outdoor walls, floor coverings and fences. If your patio, pathways, driveway, walls, deckings, fences or swimming pool have become stained, overgrown, slippery or filthy, call us and schedule their washing for a preferred time. Our workers can remove the moss, weeds, algae and soiling from the brick walls, tiles, slates and deckings with advanced machines and suitable cleaning solutions. If you need affordable and professional jet washing in Kilburn use our services by contacting our call centre or online chat. 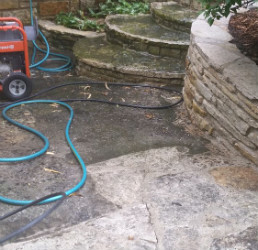 You will receive excellent pressure washing which will increase the value of your estate and make it look much better.